Last major update issued on October 9, 2004 at 04:55 UTC. The geomagnetic field was quiet to unsettled on October 8. Solar wind speed ranged between 275 and 362 km/sec, slowly increasing early in the day due to a low speed stream from coronal hole CH117. Solar flux measured at 20h UTC on 2.8 GHz was 90.7. The planetary A index was 7 (STAR Ap - based on the mean of three hour interval ap indices: 7.6). Three hour interval K indices: 13212213 (planetary), 02213322 (Boulder). At midnight there was 1 spotted region on the visible disk. The solar flare activity level was very low. No C class events was recorded during the day. New region 10680 was numbered as SEC did not consider the emerging flux areas part of region 10678. The region developed fairly quickly and has little or no separation between the opposite polarity fields. The region is rotating over the northwest limb. October 6-8: No obviously Earth directed CMEs observed. 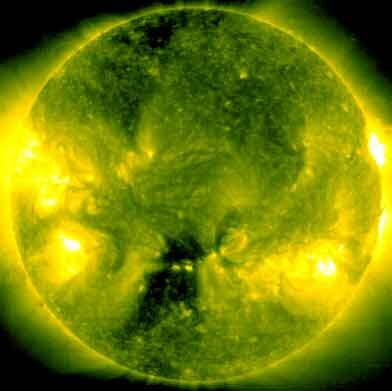 A trans equatorial coronal hole (CH117) was in a geoeffective position on October 3-4. A recurrent coronal hole (CH118) in the southern hemisphere was in a geoeffective position on October 8-9. A southward (poorly defined) extension of the large northern polar coronal hole may have been in a geoeffective position on October 7. Processed SOHO/EIT 284 image at 19:16 UTC on October 8. The darkest areas on the solar disk are likely coronal holes. 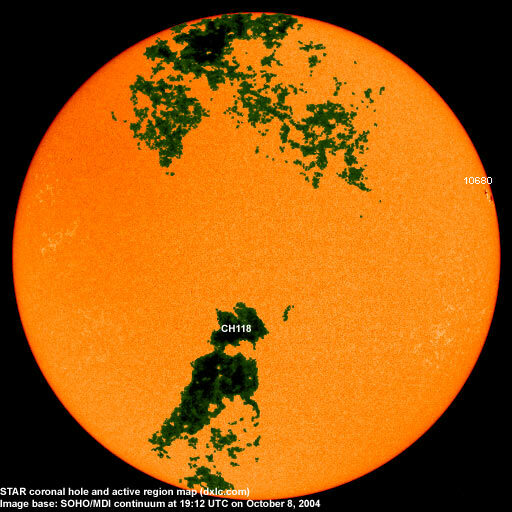 The geomagnetic field is expected to be quiet to unsettled on October 9 due to minor effects from coronal hole CH117. 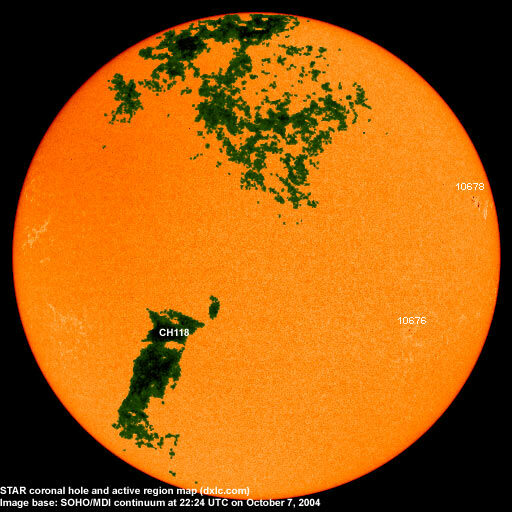 Quiet is likely on October 10 with unsettled to active conditions possible on October 11-12 due to a coronal flow from coronal hole CH118. Long distance low and medium frequency (below 2 MHz) propagation along east-west paths over high and upper middle latitudes is fair to good. Propagation along long distance north-south paths is poor. Trans Atlantic propagation conditions are monitored every night on 1470 kHz. Dominant station tonight: WLAM Lewiston ME. On other frequencies propagation was best towards the northeastern part of the USA and the Canadian Atlantic provinces. Some stations from the Caribbean were noted as well.